One definition I've heard is that introverts become fatigued when they have too much social interaction. Extraverts on the other hand get energized by social interaction. Why ? It may be related to an organism's baseline of arousal. The idea is that extraverts may have a lower baseline arousal rate, that they enjoy raising by interacting socially. Introverts have a high baseline level of arousal, which gets raised too far by too much social interaction. It is thought that extraverts are the majority making up 85% of the population, and introverts 15%. This would explain why open office plans are the norm. Ironically introverts often self select for work that requires deep focus, and end up having to do it in open plan offices designed by extraverts who see nothing wrong with that. It was a paradigm shifting book for me, made me understand some people in my life in profoundly new ways, and helped me discover stuff about my own personality. It's particularly interesting to think about introversion / extroversion in terms of managing energy levels. “The four-month-olds who thrashed their arms like punk rockers did so not because they were extroverts in the making, but because their little bodies reacted strongly—they were “high-reactive”—to new sights, sounds, and smells,” Cain writes. “The quiet infants were silent not because they were future introverts—just the opposite—but because they had nervous systems that were unmoved by novelty.” These “high-reactive” babies grow up to be children who need a lot of time to decompress after school, need time alone to be creative and explore. They are introverts, not anti-social, Cain explains. There is a big difference. Definitely second petewarden's suggestions 'exercise' and 'get a hobby'. You do not have to join a gym or anything. Exercise can be something as simple as going walking for an hour with your iPod (or equivalent). No matter what the particular exercise, the fact is that it will usually get you out of your own head for awhile. Aside from those I would suggest maybe reading Party of One  and/or Quiet , as they bring to light very well the fact that mainstream society unfairly and illogically looks down upon those who prefer aloneness. Being surrounded by laughing groups of sociable people has a way of making anyone not involved feel like they are missing out on something or that there is something wrong with them, when this might not be the case at all. Props for such an honest post; and I hope you feel better soon. She sounds like a classic introvert. Slowness is a strength is a tenet of one of my favorite books Quiet . I believe knowledge is power. You've fallen into the popular condonation that introversion is bad. It's not. It's just different from the norm. Around 30-40% of people are introverts. Extrovert tendencies are more numerous and visual so we assume it's "normal." Introversion is normal too. I highly recommend the book Quiet by Susan Cain. 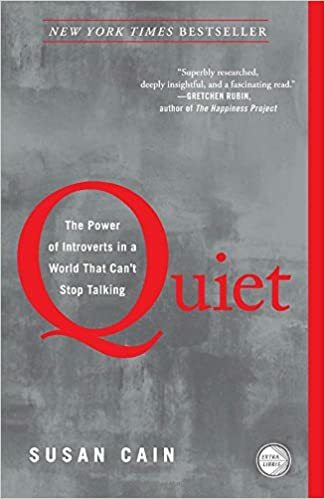 It delves into the truth and science of introversion. Knowing why I act of feel the way I do has let me address the causes, not the symptoms. One example: introverts hate small talk, but love deeper conversation. We have trouble breaking the ice, but hold our on once the topic is "meaningful." You might trying going to places that facilitate that. Go to intimate pubs instead of crazy bars. Join a book club. Go to events for causes where you'll have a topic to discuss with others. Ask questions more than making statements. Other people like talking about themselves, and the more words they spew, the more things you'll be able to comment on. Remember that your Facebook newsfeed is not real life. People only post the good things in their life. Since you have one place to hear it all about it, it seems like everyone is doing something cool all the time. They're not. You're doing something awesome by traveling the world. 9/10 of your Facebook friends would be jealous of your experiences. When you feel like you're missing out, ask yourself, "if I could go, would I want to?" You'll find that you would actually choose not to most of the time. How can you miss out on something you don't actually want? Art of Manliness did a article exploring this feeling.